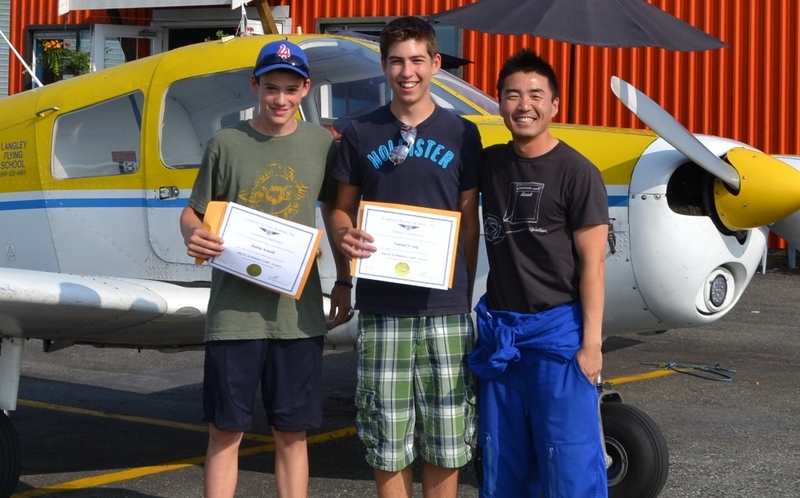 Langley Flying School offers five distinct Pilot Camps Levels which focus on three areas of pilot skills: Basic Aircraft Manoeuvres, Cross-country Flying, Advanced Upper-air Manoeuvres, Landings and Takeoffs, and Instrument Flying. The Camps are conducted in our School facilities3 at Langley Airport, with each Camp running for five days—Monday through Friday. On each day, Groundschool classes are conducted in the morning, and flight training begins after lunch in the afternoon. All of the Camp Levels are based on the “partner” system of instruction in which two students of similar age are paired. The partners learn at the same pace and are assigned joint responsibilities, including Groundschool assignments and aircraft preparation for flight.7 For students enrolled in Basic Aircraft Manoeuvres, Cross-country Flying, and Instrument Flying, the partnership extends into the cockpit, effectively doubling the “air experience” of each student. With these Camp Levels, one of the partners occupies the pilot’s seat for the first hour of flight while the other partner observes the training from the rear seat.8 When the hour is completed, the aircraft lands for a “seat-change” and the partners switch seats for the second hour of training.9 Because of the training requirements associated with Advanced Upper-air Manoeuvres and Landings and Takeoffs Camps, where only one student and one Flight Instructor are permitted in the aircraft during a flight owing to the nature of the flight training,10 the partners will fly in two separate aircraft concurrently,11 or the same aircraft in succession. Some students register as partners, already paired; other students register as individuals and we therefore seek to pair them with other students who are looking for partners.The following is a list of available partners. The Registration Form can be accessed through this website; complete this form and fax or mail to Langley Flying School. The tuition for each Camp is $1600.00, which includes both groundschool and flight training fees. All students will be required a Langley Flying School Flight Training Handbook ($49.95), Transport Canada’s Flight Training Manual ($19.95), a Pilot Log Book ($18.95) and the Piper Cherokee Pilot Operating Handbook ($19.95). Camp II students will additionally require an Aviation Chart ($18.95).12 Student tuition and fees are subject to the GST. To facilitate enrolment planning, a $300 deposit is required.13 Payment of remaining fees and costs is required on the first day of Camp; Visa, MasterCard, American Express, and Debit Cards are accepted. Pilot Camp students should normally be twelve years or older, but exceptions can be made on a case by case basis—contact the Office Administration, for further information on exceptions. Registration of students under the age of 18 requires parental consent—see the Registration Form. The aircraft that students will fly is the Piper Cherokee Cruiser, a low-wing, four-seat aircraft that is exceptional for initial flight training as it provides the smooth and balanced flight-handling characteristics of larger aircraft. The aircraft cruises at a speed of 212 KPH, and is powered by a Lycoming O-320 Engine; the aircraft, engine, and equipment are maintained in accordance with an approved Transport Canada maintenance program, and all maintenance on the aircraft is contracted to an Approved Maintenance Organisation certified by Transport Canada. All of Langley Flying School’s aircraft are equipped with four-place, voice-activated intercom system whereby Flight Instructors communicate with their students via hearing-protection headsets equipped with boom microphones. Students are issued with headsets prior to each flight. Each aircraft is also equipped with a VHF Radio for the purposes of communicating with Air Traffic Control, and a Radar Transponder that automatically provides altitude information to Air Traffic Services Radar. Training flights are subject to delays caused by weather or aircraft maintenance.14 In the event of such delays, the training flight will be booked at a later and earliest date. 1 An important message that we attempt to provide to students is that becoming a professional pilot is not simply a matter of learning to fly, but is instead rooted in basic human qualities such as effective leadership, co-operation with others, safety management, a healthy lifestyle, and—perhaps most important—hard work at school. In actuality, it is not difficult to become a professional pilot, but if you want the top pilot positions in aviation (which typically entails flying the faster and larger aircraft), you must demonstrate success in your school work, whether it be high school, college, or university. If you want to fly a multi-million dollar aircraft, you must demonstrate advance pilot skills (be a “good stick” as it were), but you also have to demonstrate effective study skills—reading, writing, functional mathematics, etc.—and commitment to your tasks. While the race for the top pilot jobs is and will always be a race to accumulate flying experience—accumulating as many flying hours as possible and as early in your professional career as possible—the race is also one of demonstrating academic success and those basic human qualities. 2 Langley Flying School has a fleet of four Piper Cherokee aircraft that are designed for initial flight training, and two of these aircraft are dedicated to the Pilot Camp for a portion of the daily aircraft booking sheet (the third aircraft is held in reserve for the Camp and is otherwise reserved for our regular students). Camp training flights will be conducted between 1 pm and 4 pm. 3 All of those considering enrollment in the Pilot Camp are encouraged to visit our facilities at any time. We are located at Hangar 4B at Langley Airport, with training operations centred out of the west-side (or “runway side”) of this Hangar (parking is provided on the “street side” of Hangar 4B. Access to the School is from 216th Street, entering just south of the large DC-3 aircraft that is quite visible. Follow the access road past the helicopter school and the Canadian Museum of Flight and the hangar identification is quite visible. For pictures of the LFS, see the photo gallery on our website. 4 Pre-flight preparation of this nature—concentrating on reviewing the planned exercises to be flown in the air—is referred to as Preparatory Ground Instruction. During this time the Instructor presents to the students the aim of the air exercise, the reasons why the exercise is important, and steps or pilot techniques that are used to accomplish the exercise. Preparatory Ground Instruction concludes with a review of safety considerations that will govern the training flight. Not every training flight is preceded by Preparatory Ground Instruction; instead, this is provided only when a new exercise is planned. Every flight, however, is preceded by a Pre-flight Briefing where, just prior to boarding the aircraft, the Instructor reviews the planned sequence that will occur in the flight, the state of the weather (students must do their own weather briefings), NOTAMs (published “Notices to Airpersons” regarding such things as temporary airport and Air Traffic Control restrictions or closures), the aircraft’s fuel state and weight and balance. Pre-flight Briefings also include a review of safety issues. 5 There will be slight variations in the length of each flight, with Instructors making an effort to ensure each student has a minimum of one hour in the pilot’s seat during flight. At the end of the week each student should have the 5 hours recorded in their Pilot Log Book—if they are short, an additional make-up flight will be organised. 6 There should be no mistake here—students will be at the controls for all but a few minutes of their training flight. To some this may seem strange—akin to handing over the car keys—but in fact the environment of flying is such that there is lots of room (most of the time, anyway) for “student errors”. Unlike the driver of a car, a student pilot does not have to keep the aircraft between “painted lines”, nor does the student pilot have to be worried about other drivers and other vehicles travelling only feet away! On the first flight the student pilot and the Instructor agree upon and practise simple coded words that establishes a contract for the transfer of aircraft control (by way of the control column and the rudder pedals) between student and Instructor. There can be no confusions at any time during a flight regarding who is controlling the aircraft, and by uttering the phrase “I have control,” the student knows to immediately release all pressure on the controls and respond “You have control.” Instructors typically have a clearly defined “safety envelope” with respect to aircraft handling by the student, and automatically intervene when the envelope limit is approached. Students also quickly develop a “comfort zone” with aircraft handling which precludes “dramatic” intervention by the Instruction. 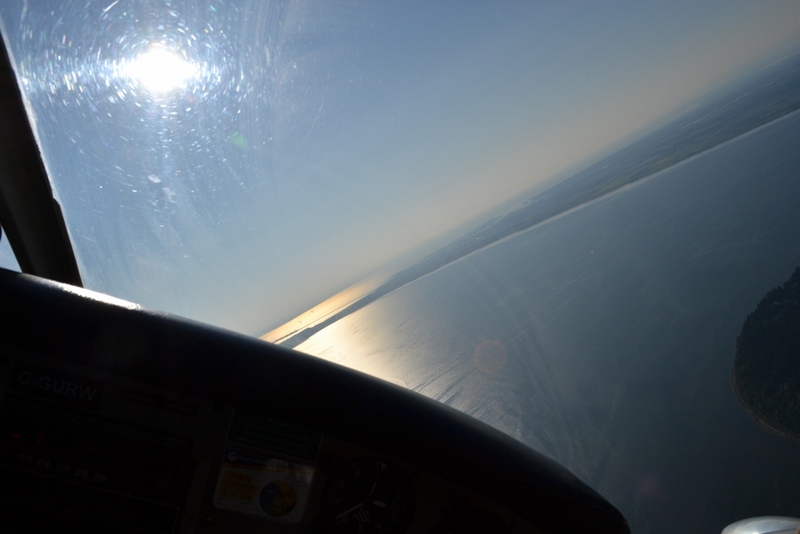 Overall, however, the Instructor job is to maximise the student’s time “on the stick” during a flight. They will “take control” whenever they have to explain things to their student (so that the student is not distracted), and of course they will control the aircraft during the more advanced phases of a flight such as the landing. 7 We firmly believe that the partnership system is the key to learning in the Pilot Camps. A good instructor knows that being effective requires what is referred to as “developmental teaching” whereby the Instructor guides the student through “self-learning” and “discovery”. With student partnerships, developmental teaching is enhanced with each student learning from his or her partner. Partners are assigned joint tasks whenever this is possible. When the partner is actively completing a task—whether it be in the classroom, on the airport ramp, or in the cockpit—the other partner is also learning by observation. 8 The partner in the rear seat is connected via headphones to the dialogue occurring in the front seat as well as the dialogue occurring over the radio with Air Traffic Control. The partner in the rear seat is always charged with the continuous responsibility of keeping an eye out for any vicinity air traffic and, because he or she is connected to a voice-activated intercom system, the partner can always relay messages to the pair in the front seat. 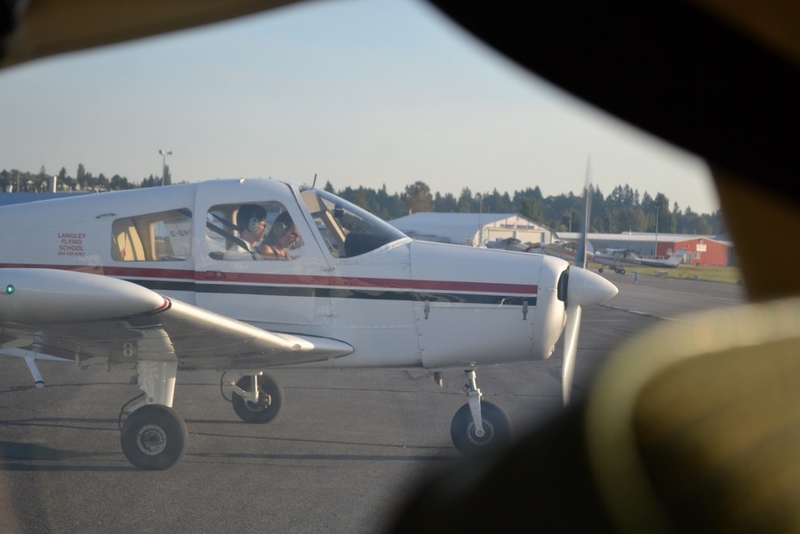 9 Instructors make an effort to land for the seat-change at airports other than Langley Airport so that students are exposed to a variety of runway and Air Traffic Control environments. 10 Upper-air manoeuvres—such as stalls, spins, and spiral dives—commonly involve high “g” loading (gravity force) on the aircraft. Regulations that govern the performance of these manoeuvres, and the loading requirements established by the aircraft’s manufacturer, require that the aircraft be operated in what is referred to as the “utility” loading category, which restricts fuel quantity and prohibits passengers. While the carrying of passengers during landing and takeoff training is not prohibited by regulations or the manufacturer, it is Langley Flying School policy that passengers can only be carried on board during this exercise with the prior consent of the Chief Flying Instructor. 11 Where the School’s booking sheet permits, the partners will prepare and fly separate aircraft with separate Instructors—they should takeoff and land within minutes of each other. The air exercises flown by the partners will be the same—preceded, for example, by Preparatory Ground Instruction and/or Pre-flight Briefings in which both partners are present. If the booking sheet does not permit concurrent flights, the partners will fly the same aircraft in succession. 12 Included in this equipment are the E6-B Flight Computer, the Chart Ruler, and a Douglas Protractor. The E6-B Flight Computer is the generic name applied to various types of circular slide rulers that are specifically designed for pilots. This instrument provides quick and easy calculation of such things as the effects of wind on groundspeed and aircraft heading, fuel consumption, fuel endurance (time), true airspeed (airspeed corrected for altitude, temperature, and pressure). An electronic version of the E6-B Flight Computer is also available. The Chart Ruler or Navigation Plotter is quite simply a ruler specially designed for use by pilots on navigation charts. The Navigation Plotter includes a protractor designed to measure cross-country tracks. The Douglas Protractor is an instrument designed to measure cross-country tracks on aviation charts. Students will be provided with a Pilot Log Book, which records pilot training and experience in accordance with Transport Canada requirements. 13 The requirement for a deposit is simply to deter last minute cancellations which could leave one of our students “partnerless” with insufficient time to organise a replacement. Deposits will be returned owing medical or personal reasons at the discretion of the Chief Flying Instructor; however written proof of the circumstances warranting cancellation must be provided. 14 The weather requirements for training flights are strictly applied by Instructors (see the Flight Rules and Safety Precautions for Private Pilot Training). This is, of course, a matter of safety. Also related to safety is aircraft maintenance. There are equally strict rules governing the functional equipment required on board an aircraft—especially a commercial aircraft. If the “airworthiness” (health of the aircraft) is in doubt, the aircraft is formally grounded and referred to our Approved Maintenance Organisation. Often maintenance problems can be resolved quickly and the aircraft is released as airworthy. Everyone in flight training must be prepared to cancel or postpone a flight for reasons of safety.